A layered look without the timely process. 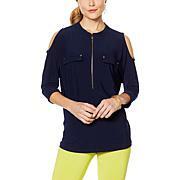 This top gives a streamlined touch to your bottom staples. Top it off with a blazer or coat for added versatility. I absolutely LOVE this top! Great quality & very stylish. Very comfortable! I got the flowered one.. very pretty. Nicely made. As a plus size lady it was a bit too billowy for me, even belted. Had to return it.. for a slimmer person its really a beauty though! I purchased this in the size that I wear and it fits absolutely perfect. 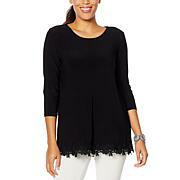 It is very flattering its very flouncy when you move, just the right length and it has a perfect flattering top. I went back and ordered every single color I absolutely adore it. Definitely something you can dress up or dress down. Im sure it will be my go to for all sorts of occasions. Love it!! I saw this and immediately purchased it for the style and length to accommodate coverage for 2 medical pouches. 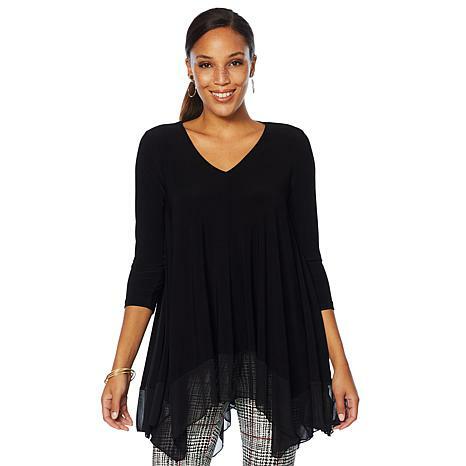 It is the most comfortable but stylish tops I own and wish it were in colors.Awesome feel of fabric and flow with movement! I 1st purchased and wore the med in burgundy. It was a little snug at upper back area( I'm large breasted), but I kept and also ordered a Large in same color! It's pretty, nice and flows, and washes very well.